December 17, 2018 | Category: Ujjwala Yojana. 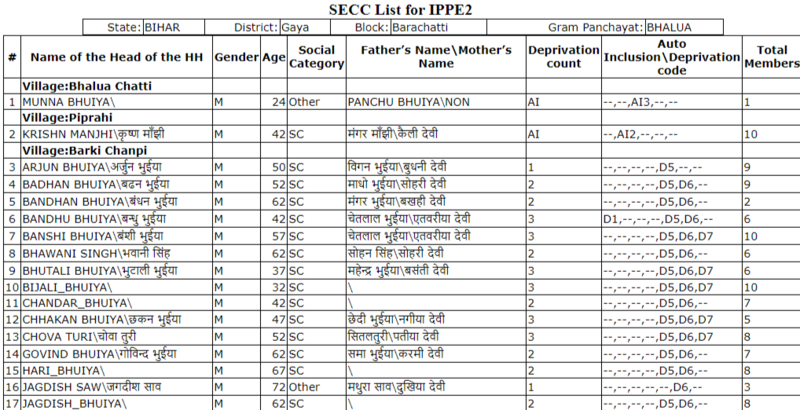 Pradhan Mantri Ujjwala Yojana List of BPL candidates 2018-2019 can be checked in IPPE2 SECC-2011 database. Check your name in the BPL list of Ujjwala Yojana by downloading the state wise list of SECC-2011 data. Ujjwala Yojana for providing LPG connections to all BPL families has been launched in all 36 states and union territories including the major state of Uttar Pradesh (UP), Rajasthan, Gujarat, Uttarakhand, Odisha, Bihar and Madhya Pradesh (MP). SECC stands for Social Economic Cast Census, the last census was held in 2011 and you’ll have to refer to that data to find if your name exists in the BPL list of Ujjwala Yojana based on exclusion or inclusion in MGNREGA scheme. Just follow the below simple steps. STEP 1: Visit the official government website using this link where IPPE2 SECC-2011 Data (NREGA BPL LIST) is available. STEP 2: You will see the following screen after clicking the link. STEP 3: On this page, select your State, District, Tehsil / Taluka and then Gram Panchayat to view the list of BPL candidates who are eligible for PM Ujjwala Yojana. STEP 5: Now go to the bottom of the page and click on “download in excel” link to download the complete list displayed above. STEP 6: After opening the Excel file, press Ctlr+F to open the find dialog box and type your name to search. If you do not find your name in the list online, please visit your nearest gas agency to check your eligibility. If you find name of any women in your BPL family, then you are eligible for the scheme. The list excludes Telangana because it was formed after 2011. However, list can be obtained from Andhra Pradesh data by selecting the districts falling in Telangana. user id kaha milta hai tora bota dena. Dear Sir, How we can find BPL list…plz tell us. Sir mera nam anowar ali he me goalpata distic se ho mera bpl list me nan he lekin lekin ab jo bpl lpg ka list diea oha mera nam nahi q sri…. jin logo ka seccdata me nam nahi hai aur vo BPL card dharak hai unko PMUY ka labh kaise milega. aur un logo ka list me nam (yani AHL no.) kaise melega. Hamare village Me Approx 250 BPL Card Holder he but list me only one name hi he to ye to ye one name hi kyu or kab update hoga Please Replay as soon as possible . sirf ek village ki list download kaise hogi? SIR MUJHE UP BIJNOR KI UJJWALA YOJANA LIST DEKHNI . USKO KAHA SE DOWNLOAD KIYA JAYEGA. I am bpl person .I want to pmuy gas connection. Mere Nam Hari ram Yadav Hai. Mai Bhut Grib Hu. Sir Mai ROj Khana Nhi Kha Pata Hu Gas KI Vjhse Sir MAi Chaha hu ki ap gas dene KI Kripa Kre, Aap ka Ahsan Hoga Sir Meri Bibi Bdi Presan Rkrti Hai Khti hai ki gas leke aiye bchoo ko school bhi jana rhta hai. Apki ye yojana sunakar bahut khushi hui ji sir mujhako bhi avash dijiye . Kya ye yojna sirf amiron ke liye hai? sir mera ghar m gas cannection nhi hai mera form reject ho gaya hai kyu ??? please batao m kya karu??? ?